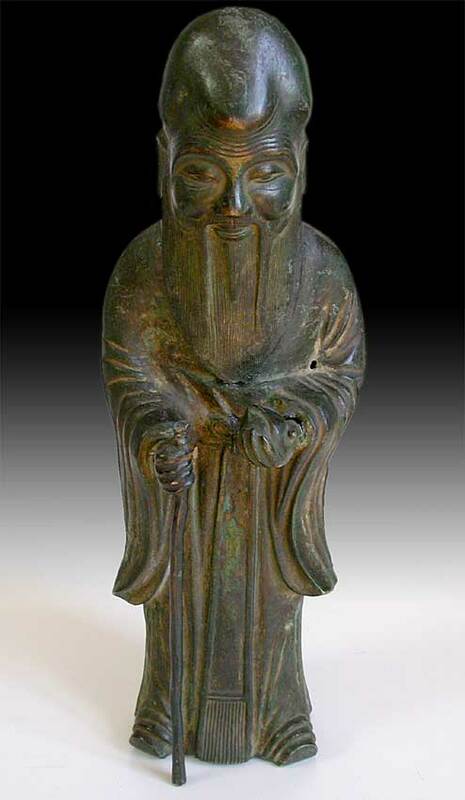 Song Dynasty, circa: 960-1279 A.D.
Holding the fruit of the P‘an T’ao which blossoms every three thousand years, ripening its peaches for another three thousand years, is Shao Lao, the star god of Longevity. His head is elongated with protruding forehead, his beard falls to his waist, his face is lined with age; he smiles with kindliness upon the world. Shao Lao holds a staff which may have been topped with carving that has been lost. This archaic piece has aged beautifully, showing a dark patina that flashes with rich greens. The base color of the bronze has turned over time to a deep umber; deposits of oxidation mark the folds and grooves in the metal, and bring out the delicately chased lines of the beard. The flowing simplicity of the design has a hieratic dignity and firmness. It has the sense of benevolence with which it was imbued through a thousand years of worships.